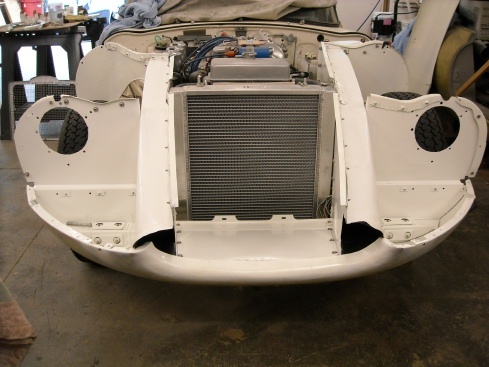 Last month’s article discussed installation of the doors and windshield. It appears that I am working towards the front of the car. A job I have been avoiding is a big one, that being the restoration of the bonnet. The original bonnet has been standing in the corner of my shop since I took it off the car many years ago. It is painted a bright red, like the rest of the car was and at least superficially appeared to be in good shape. But closer examination revealed otherwise! Jumping forward just a little, the E-Type bonnet is an iconic feature of the car. It is hinged at the front, allowing the entire assembly to be rotated forward for access to the engine compartment. It consists of a center section, two wings with openings for the wheels, and a lower nose section which is hinged to the support frame on the front of the car. Behind the central opening leading to radiator there are two long air ducts on each side, one leading to the heater and the other providing cool fresh air for the carburetors. Several bulkheads, similar to those used in aircraft or boat construction serve to stiffen and support the outer skin in several places. My first job was to take numerous digital photos of the inside and outside before disassembly. Next disassembly began. I laid the bonnet like a turtle on it’s back in the middle of the shop and began to take it apart. 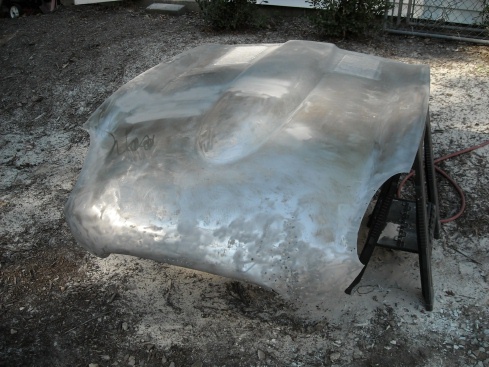 The bonnet is assembled with very little welding, rather the various pieces are held together with sheet metal screws, bolts, and structural adhesive. 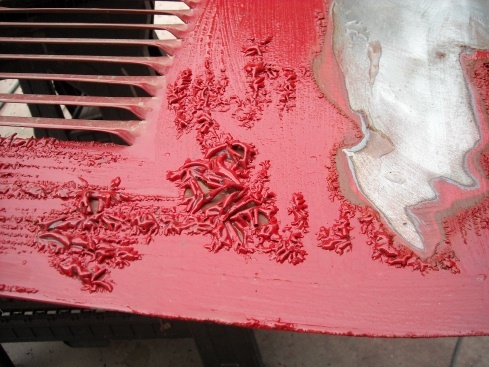 The use of structural adhesive, as we will see, eliminates the need to have fasteners or welding to the outer surface, giving it a clean smooth appearance. reason. I had to grind this layer off with the abrasive wheel. Here is the center panel completely stripiped. It was in fairly good shape, all in all. I had to hammer and dolly the area on the drivers side of the radiator opening. Here is one of the side panels stripped. You can see all of the holes where someone did an “external” colision repair by pulling it out with a slide hammer. Remarkably there was only minor rust in the center section and wings. 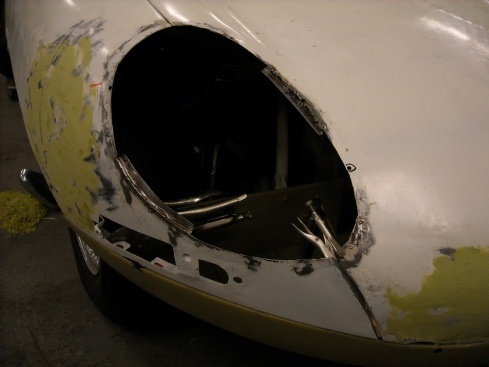 But there was evidence of very poor workmanship by someone who had previously attempted to repair fender bender type impacts to the nose and wings. 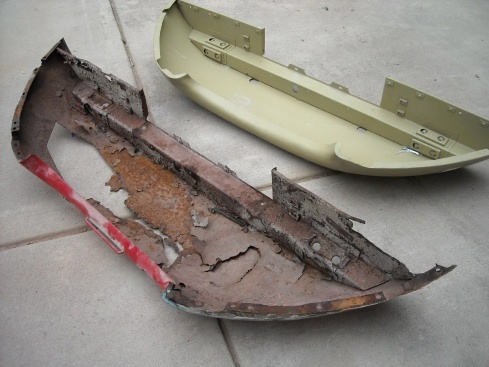 Thick layers of body filler were laid over poorly re-formed metal surfaces. In defense of the prior work, it is very difficult to access some of the inside surfaces for hammer and dolly work unless the bonnet is fully assembled. Fortunately, I did eventually have all the parts disassembled and proceeded to use my hammer and dolly to beat the various surfaces out as close as possible to their original profile. Dude! Nothing wrong with that fender that an inch of bondo won’t cure!! The bulkheads were another story. The collision damaged has squashed some of them like an accordion. Since they were rather simple shapes I decided to fabricate new ones. This decision was also influenced by my decision to convert the bonnet to closed headlights, which requires a different type of bulkhead to implement. My bulkhead on the bottom. Left side is squashed. 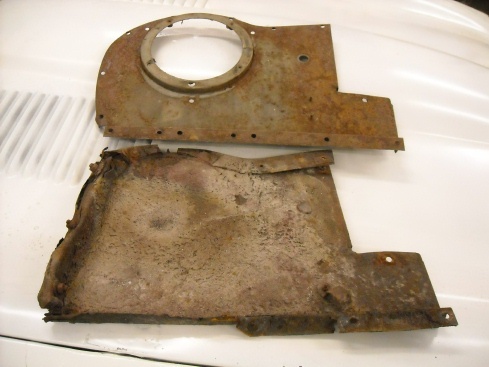 For comparison, above is a bulkhead from my 63 E-Type. Here is a picture of the new bulkhead I fabricated. The hole will facilitate installation of covered headlights. Yes, you heard correctly, I decided to convert the current open headlight bonnet to closed headlights. Based on my research and the chassis number of the car, it should have been originally configured with closed headlights. There would be several reasons why the car I acquired had open headlights. 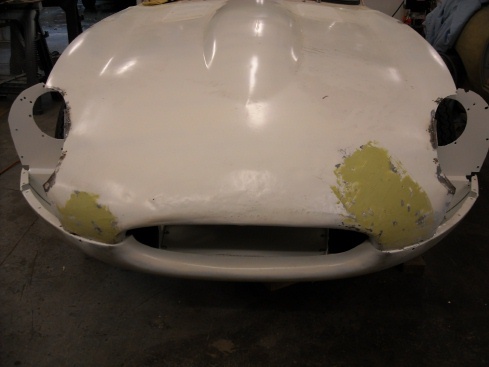 Jaguar converted all E-Types for the US market to open headlights around 1967, based on new US DOT requirements. In the day, if a bonnet was damaged beyond repair after that timeframe, the only new part that would have been available would have been an open headlight bonnet. Indeed, some folks thought the newer open headlight look was just the ticket to modernize their car’s appearance. I am not going to go into too much detail in this article regarding that conversion, except to say it requires welding in a number of small custom pieces into the existing headlight opening, purchase or fabrication of “sugar scoops” and the correct bulkheads, and purchase of glass covers, gaskets, and chrome trim rings. I will post a much more detailed description in a another post. At this point, I was ready to begin trial re-assembly of the various parts. I modified a large wheeled cart upon which to re-assemble the various parts off of the car. I had read on Jag-Lovers that it can be done this way. I do not agree! Once I had the various parts assembled, I decided to perform a trial fit on the car. The fit was terrible, in particular the bonnet would not lower before it hung up on the radiator. It was back to the drawing board. Nose section with left and right air ducts attached. Bulkheads also attached. take the wings back off to access the center section for application of the structural adhesive. 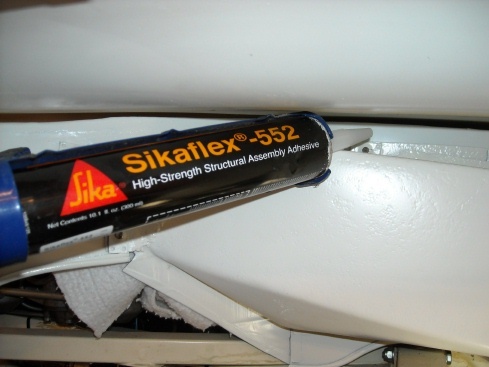 I decided to use the SikaFlex 552 adhesive based on discussion from Jag-Lovers. It is inserted into the space between the bulkheads and the exterior skin. This firms everything up tremendously. 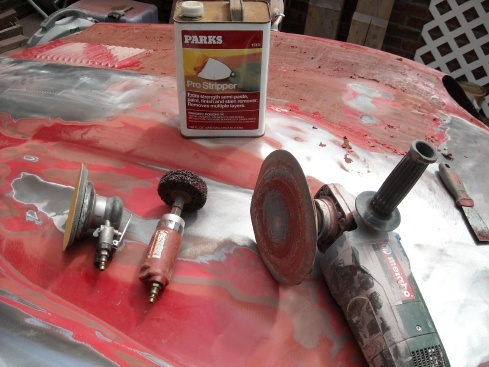 You want to make sure the bonnet pieces line up correctly with cowl before you apply the adhesive. adhesive was fully cured, I felt confident to remove the entire bonnet and put it on my cart. It was finally ready for more bodywork, filler, primer, sanding, and painting. That story will have to wait until next month’s article.